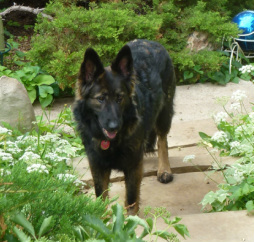 Long Coated and Sable German Shepherds-dogs of a different coat & color. 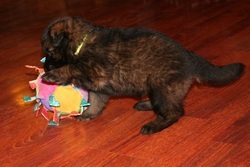 I've had many people ask me about the color and coats of my German Shepherds. 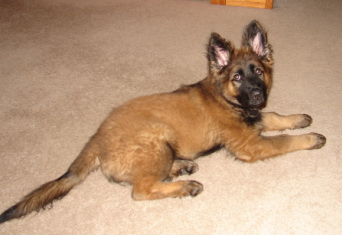 The long stock coat of a German Shepherd is a recessive trait, meaning both parents need to give a pup a long coat gene in order for the pup to be long coated. 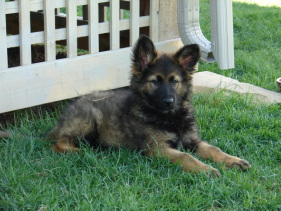 And because it is recessive, even a long coated dog bred with a dog who does not carry the gene, will only produce standard (stock) coated pups. 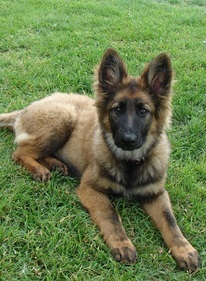 Those pups however, will now carry the long coat gene (from their one long coated parent) and if bred to another dog with the coat gene, could produce "coats" along with standard coated pups in a litter. 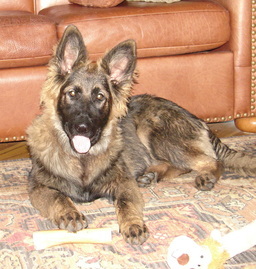 Long coated dogs have two copies of the long coat gene and do not carry the stock coat gene at all. 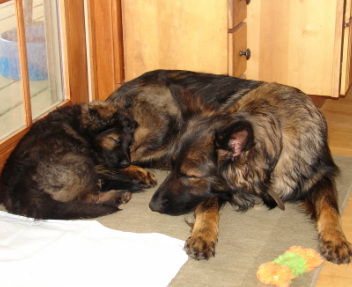 Auri's parents were both coats, therefore all the pups were coats. 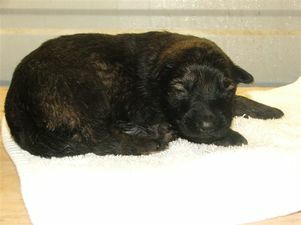 Neither Shodo's or Pike's parents were coats and they were the only coated pups in their litters, having gotten one recessive coat gene from each parent. 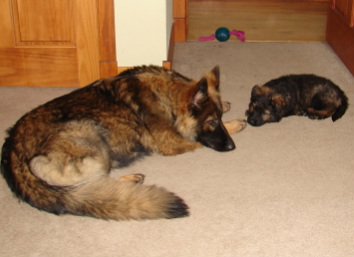 Shodo was bred to another long coated dog, therefore all the pups were long coated, although the length of coat within the litter has varied quite dramatically. Coat length varies. The Eastern European (DDR/Czech, which my dogs are) and West Working bloodlines tend to have a shorter long coat, sometimes referred to as a plush coat, whereas some West German show lines have coats nearly as long as a rough collie. 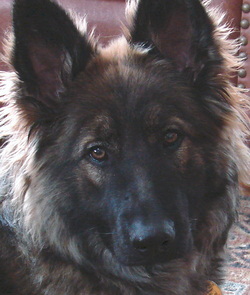 For several years the long coat was considered a fault in Germany and these dogs were not bred under strict SV rules. But with the coat gene undetected in so many dogs, coated pups were still common. 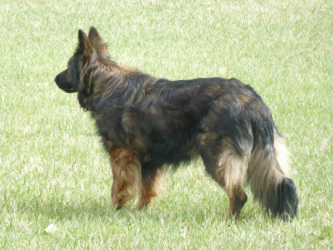 In 2010, the German SV decided to again allow the long stock hair dogs in the show ring and for breeding, believing many good genetics were being passed over. The only difference between the coated dogs and their stock coat siblings is the length of their coat. 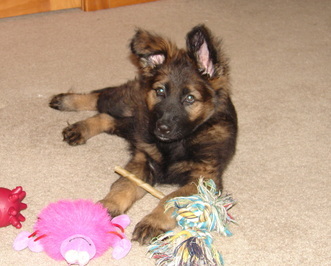 Their working ability and temperament are the same, with some people preferring the looks of the long coated dogs. 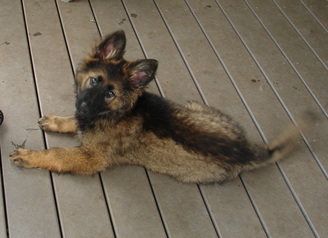 Sable is the genetic dominant color of German Shepherds. 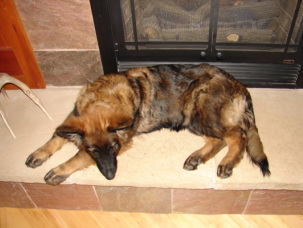 Over the years, the color of the saddle back, black and tan(red) shepherd has become the traditional color of show lines, and what most people think of when they think of German Shepherds. 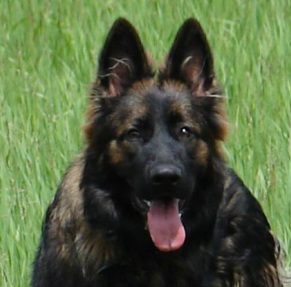 Over the last 50 years, sables and solid blacks have typically been seen in the Eastern European and West (German) working bloodlines. 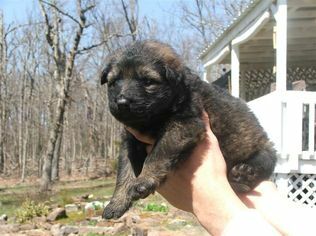 Despite what some think, sables are NOT husky/shepherd crosses, and solid blacks are NOT shepherd/lab crosses. 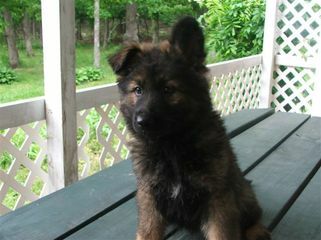 Sables range from very light to almost black, the richest colors being preferred in the German Shepherd standard. 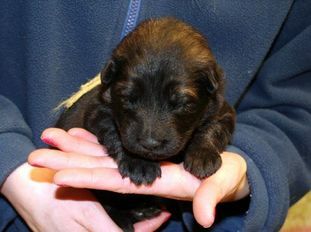 The individual hairs of a sable dog are banded with color with black tips and a gray, cream, red, or black undercoat. They often have 'spectacles' of a lighter color around their eyes. Patterned sables can very closely resemble the more common black/red coloring. Patterned sables have the red points of a black/red dog, but the areas that would have been black on a black/red dog, are actually sable. My Kola and Gracie are very dark patterned sables. 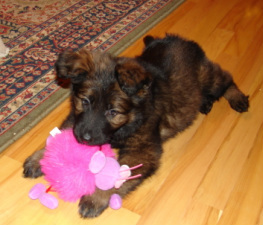 With sables, you're never quite sure what color sable you are getting when the pup is little. Sable pups lighten dramatically from 2-5 months and then darken again with their adult coat, and often continuing to darken with each shed. A general rule is that the adult color with be close to the birth color, keeping the parents' color in mind. 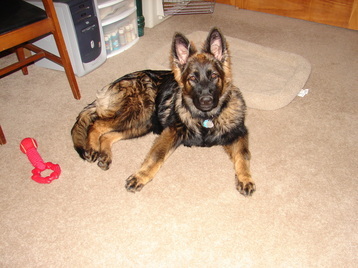 The coat color can darken until the dogs are 3-4 years old. Auri and Pike, both black sables.